Fru-Gal.org: Who wouldn't want a blue face? Who wouldn't want a blue face? My daughter loves this blue sunscreen I found for 50 cents a stick at a local discount grocery store! 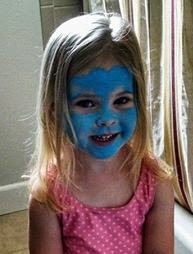 Who wouldn't want a blue face? We've been getting back to normal again after I made a quick trip home to NY during Memorial Day weekend to spend time with family after my grandfather passed away. I came home with a nasty cold bug and I'm finally feeling myself again after 10 days. It's been a low key week of getting back into homeschool and enjoying the warmer weather in our backyard. The kids love their kiddie pool and swing set, Jesse and I have enjoyed eating outside at our covered table and grilling! Nice Anna! And I'd like to see a pic of: The kids love their kiddie pool and swing set, Jesse and I have enjoyed eating outside at our covered table and grilling!